New year, new challenges ! I hope everyone is having a great 2018 !! Ours has been good , not completely uneventful, but nothing earth shattering, just normal life bumps in the roads. Overall, a nice start to the year and I am very late getting here to post !! I am struggling with balance right now. diet and health, we started a vegan diet, it is a huge adjustment and a LOT of cooking. So, I am finding a lot of difficulty in balancing these things. I have always had trouble balancing house and work, never have found it easy, but now adding the vegan diet and learning all I can about it, takes it to another level. So, I have not been in my studio to work in weeks. We had our son and his kids, our beautiful grandkids here for Christmas, our grand daughter used my studio for her bedroom and our grandson used my husbands studio for his bedroom and I lost all the momentum I had built up. I just stopped. I am trying to launch myself anew this year. I want to start a lot of fun projects and have started setting up a you tube channel in the same name as this blog, but do not have any content yet. I want to get started on that this week. I am a person that becomes absorbed when I am interested in things. That is where I am at with the food situation. I am learning so much, some of it I had learned last year when we first started the vegan diet, but then we fell off because we just were not ready. Trying to prevent health issues has us back on track so I have been very distracted with watching and reading about the health benefits and learning new things to cook, and just changing pretty much everything I have ever done in the kitchen. So, I pulled myself away from the tv just now. and decided it was time to get back to my blog and my business !! I feel like I am walking, getting ready to speed up my steps to get running again, which is where I was at when I had to step away for two weeks during the holidays !! Do not get me wrong, I absolutely loved having the kids here, and it was not their fault. My husband also took a ton of vacation during that time and we had a lot of family stuff going on . So, it is only my fault that I did not just right back into my life when they left just before new years. I have been slowly cleaning up the studio, what, that again, how many times I have posted that. Some is new stuff getting absorbed in, some is projects needing to get put away . 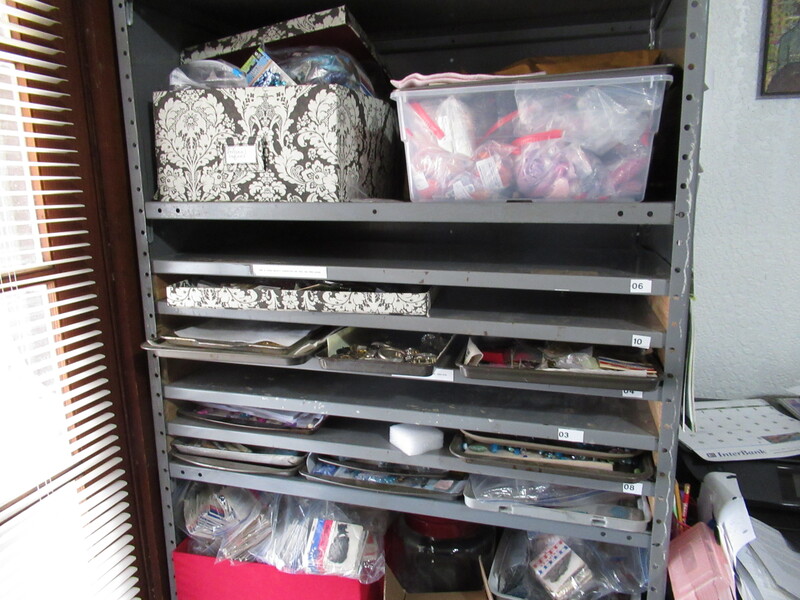 My amazing husband made me a shelf just for all my trays, and I think it was my undoing, lol. 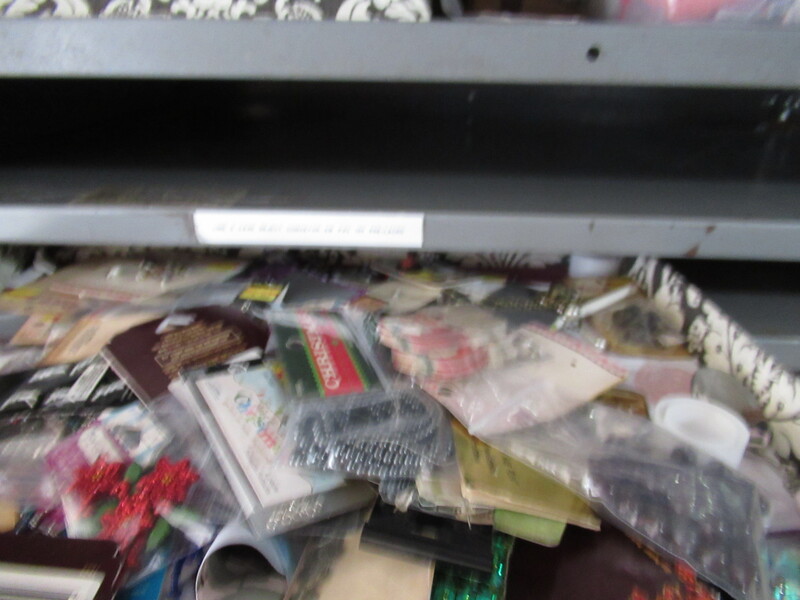 I could neatly store away my messes and not have to deal with them. This took a long time to create and I have no excuse. When I start creating, I make up a tray, then I did not put away the things on that tray, for who knows what reason, but probably just not wanting to deal with it. Over time, lots of trays piled up. There are still four on the shelf, no room to set on the table. You will see more on the bottom of the shelves, but those are an ongoing project with a customer turned good friend, some gorgeous tassels we are slowly working on. So, here is my shameful secret, it shocked even me. the top photos are the boxes all this stuff belong in. 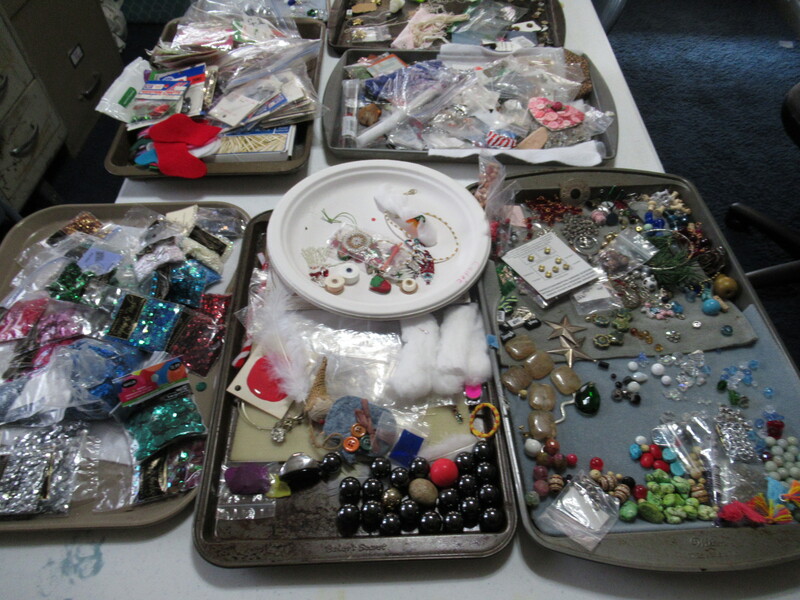 Seed beads, beads, charms, finding and misc baubles all have a place. 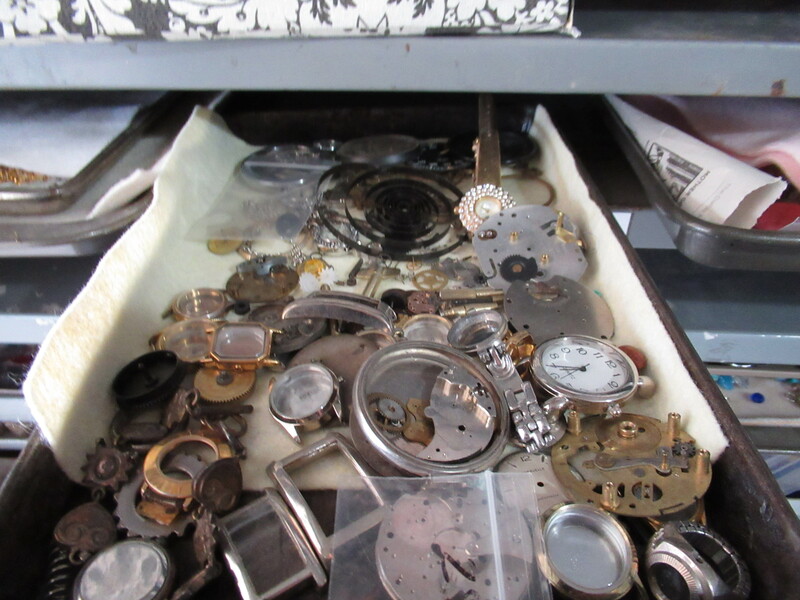 Some of these trays are new things I have to put away that I had put in a box and saved up to use later and now it is time to put them all away, some are old parts and pieces I have had on a tray forever, like the watch parts. 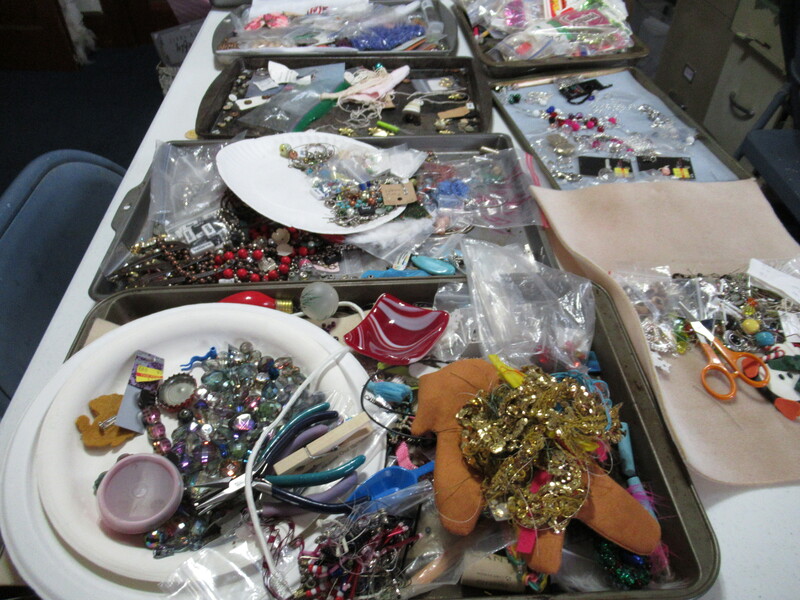 Some are my vintage and new sequins that need to be put away . Just tons of projects over the past year. I never dreamed it was this much stuff. the table is covered and there are still trays to clean off on the shelf. I am so shocked. some of this has to be a couple of years old. Set on the shelf, I forgot about them. 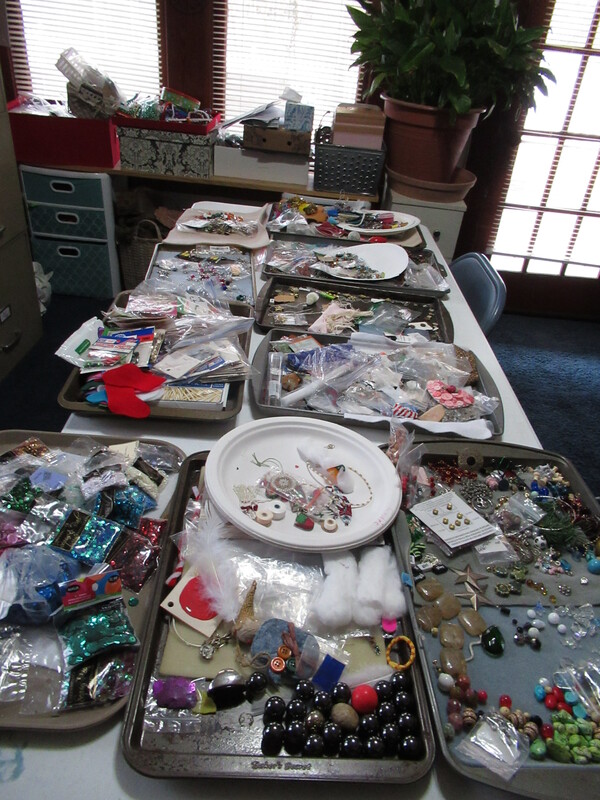 Some of the ones still on the shelf are ongoing seed bead projects and will not get put away, but I have more of those across the room in a tin, next to the dresser with the paper plates that I use for certain beadwork. 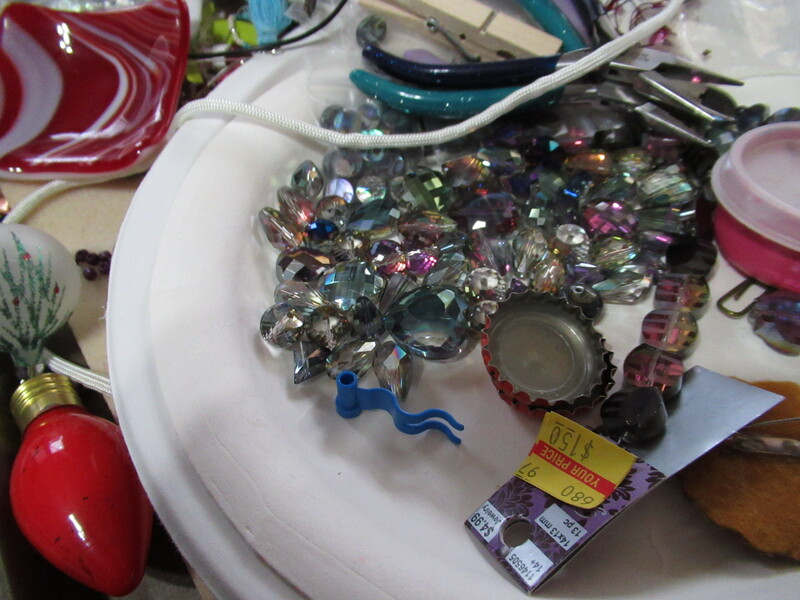 this is the stuff that makes me crazy, a pile of findings and stuff. 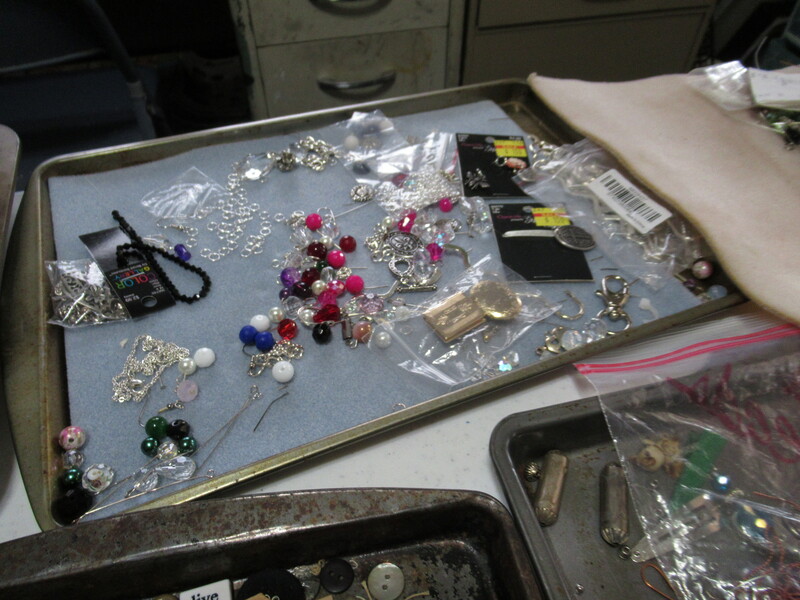 Head pins, ear wires, just have to be sorted and put away and there is more of that on my other trays. The penquin is an ornament I have been meaning to send a friend of mine for a few years and have never gotten it off to her, out of sight, out of mind I suppose. the wonderful shelves my husband put in for my trays. 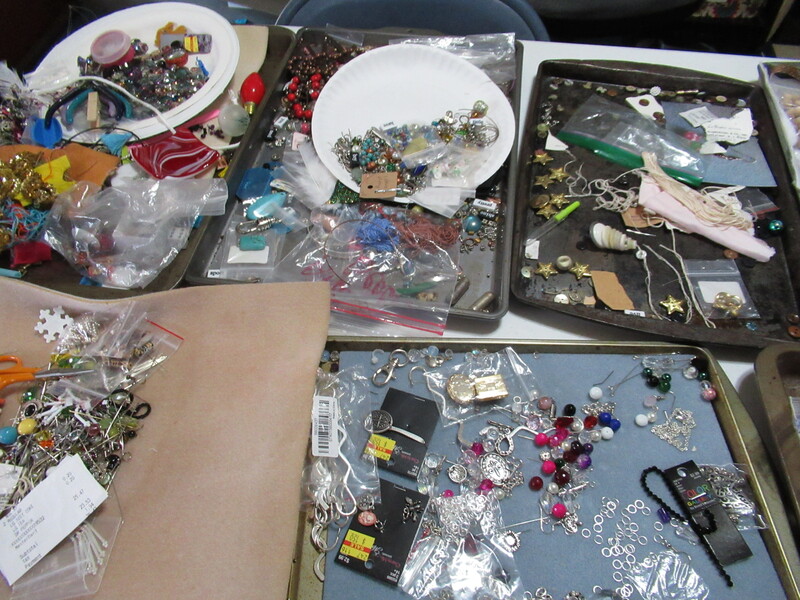 So much space, some of them are stacked in this picture and most of the stuff on the table was stacked on there too. 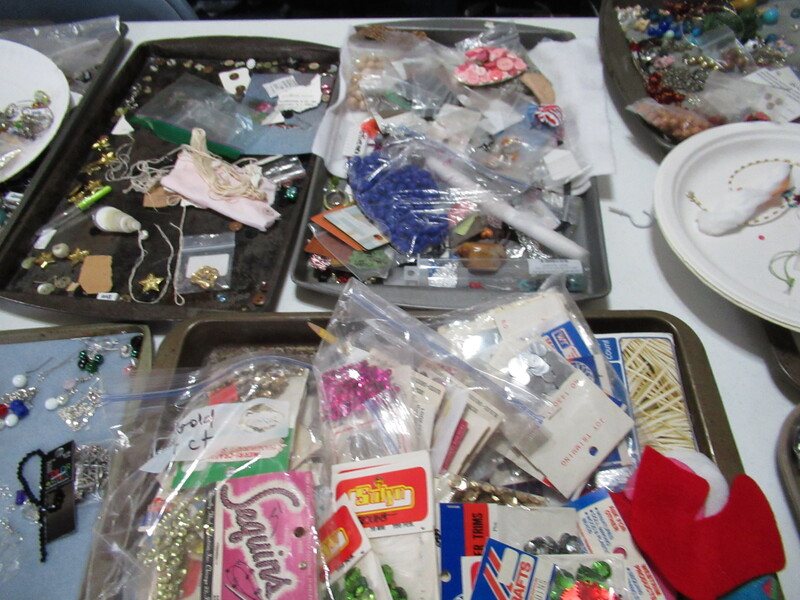 this is a box lid of new charms and pendants and stuff bought over time and stored in a box, then coffee can and we forgot about it all. got it out over Christmas to make some gifts and so what I did not use is sitting on this huge lid to a box with stuff in it too. 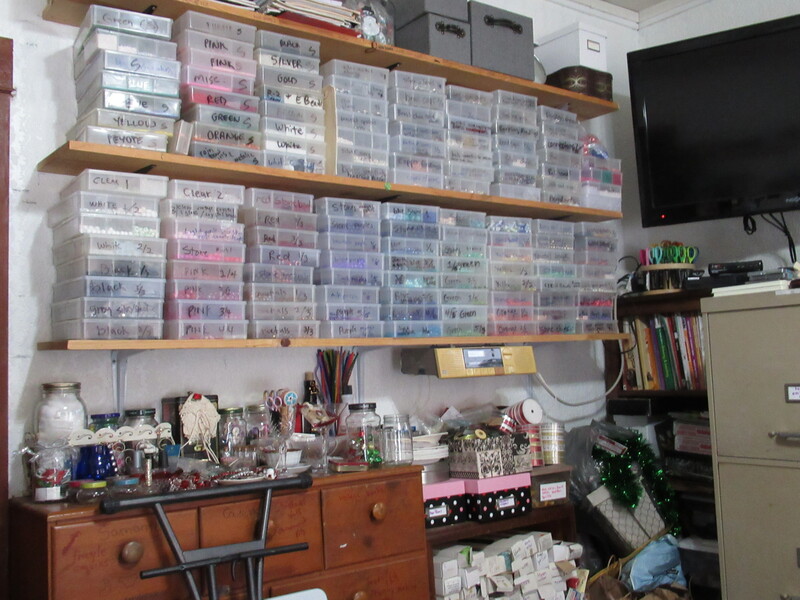 the shelf above the shelves has a huge box, that is the end view in black and white, all sequins, thousands of them, the plastic box in front is all seed beads that are not in the boxes on the s helf in the top picture. I find it is better to keep them in their bags and tubes than put them in those divided boxes. 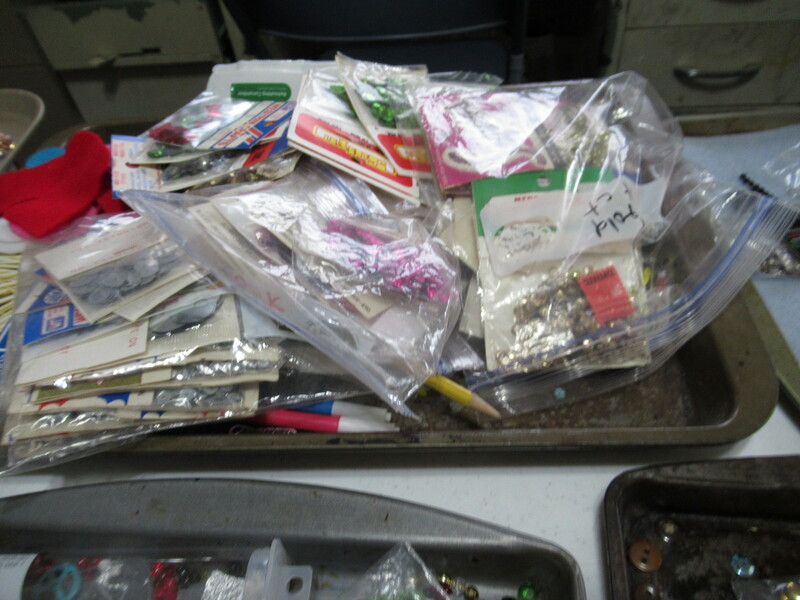 Most of the divided boxes of seed beads date back 26 or so year, or at least the first of them do and were added over a few years time as I added colors to my collection. Each box is a different color and in this box it is gallon bags with the different colors, same with the box of sequins. So, this is probably my biggest obstacle to getting started again. So, my goal is to start attacking these trays and getting them put away. 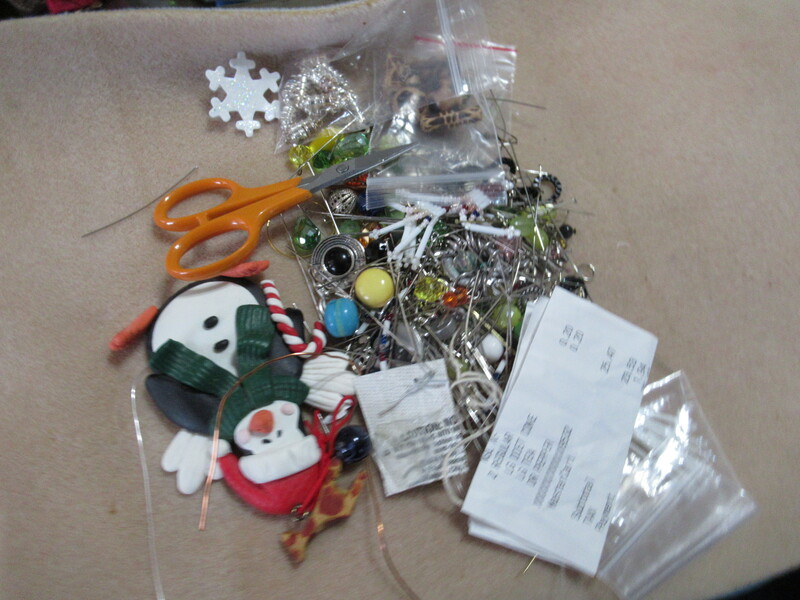 A big job, but it is actually a relaxing one, I just have to get my ADD brain wrapped around where to start !! 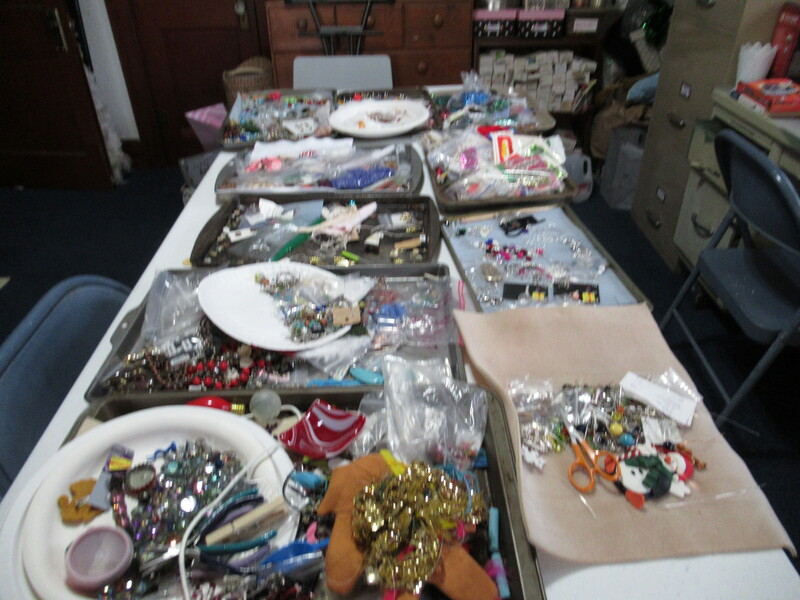 Believe it or not, I already took care of a tray or two, then they ended up with the sequins on them to put away. 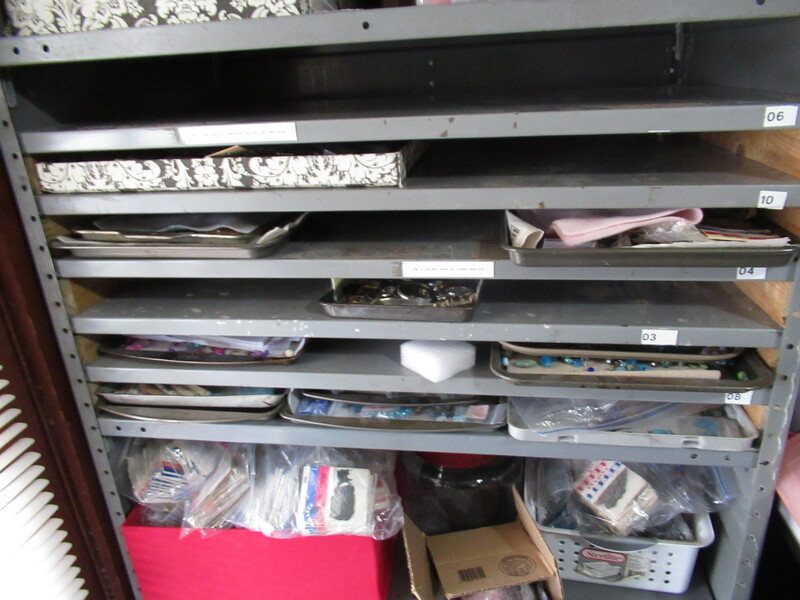 One tray is all my new sequins , and the other is vintage I have to figure out what to do with, list or back into the bulk box, the red one you see in this picture and another box next to it, and another bigger one behind the red one that you cannot see in the picture. 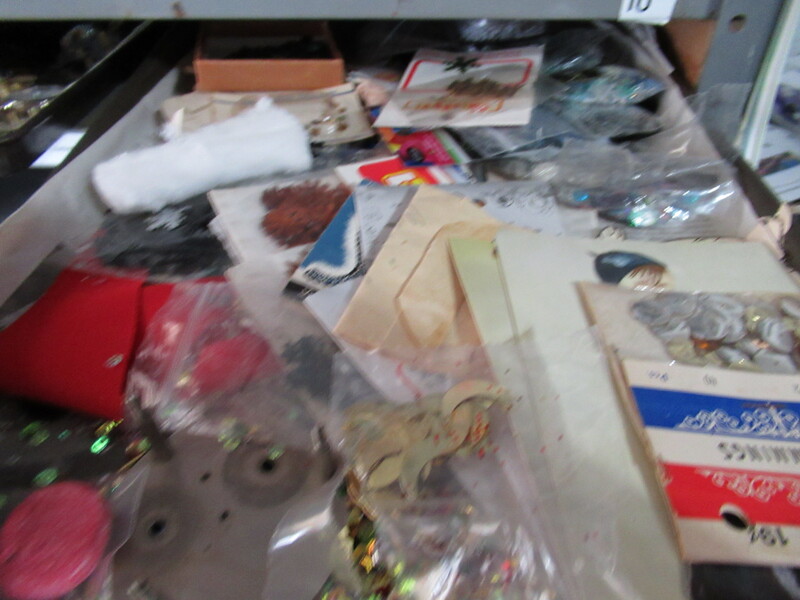 There are still a ton of vintage sequins even though I have sold a lot of them !! My biggest issue is I cannot fill too many new boxes. I am out of space unless I start on the top shelf and I do not want to do that. I only have space for about two more boxes after I box a bag of beads on the short stack that is the only place left to put new boxes. So. much . stuff. I am truely blessed and appreciate each item, now it is time to treat them with the respect they deserve !!! so, off to the trays I go. I promise you will hear from me again !!! Thanks for stopping by. If anyone has advice on how to balance being a housewife and run a creative business, I would love to hear it. I am going to work hard to figure it out and will share as I do !! ← Happy New Year 2018 !!! !